thinking of a little bit of spring for the sideboard! & holds a little blue speckled egg. and the smell of fresh cut green grass. & where a little sun was shining! I think I am finally getting caught up with visiting everyone. some party goers~ so much talent out here in blogland!! I do try and stop by to see your link ups but sometimes miss a few ~ I apologize. do my best to try to not feel guilty about it if I don't get to each one. your support and your comments! All of you make this party and blogging so much fun!! $3.00 table- just look at it now!! 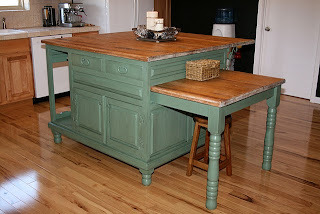 Audistree shared her kitchen island makeover- such a beauty! Amy from Maison Decor shared these fabulous tablecloth drapes- divine! love them and love that trunk they are on. Let's get this party going!! Share your decorating, flea finds, designs, etc. just share what you would like to share this week! but would love help in spreading the love! Linky tools is moving thumbnails to another server- so half of the thumbnails are not showing up at this time. Linky tools is working on this and hopefully it will be fixed soon and they will show up again. Hi Courtney, looks like we both have nests on the brain today! Thankyou for a wonderful party! Ohhh...such a sweet spring vignette, my friend! I just adore the little bird's nest and egg! Ohhh...and that is a lovely painting too! Yes...I do believe that spring is starting to sing over at your place...ever so sweetly! Thank you for sharing your beautiful spring cloche with us today! And...thank you so much for hosting this fun filled Friday party! I'm just tickled that I was able to join in again this week, my friend! I'm glad things are getting back to normal! I'm seeing lots of nests. (Mine too! 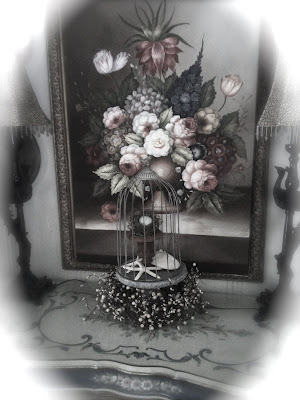 )But I do love the arrangement in your sweet birdcage! I could never do a linky because I couldn't do NEAR enough visits. I appreciate yours whenever they come! 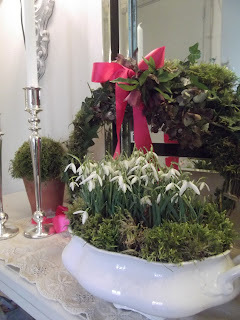 Your spring vignette with the rusty urn, bird's nest, white berry wreath, gifts from the sea, are truly inspiring. I have been thinking of you and the snowstorm damage. I know you have a mess to clean up, and I hope that you can get thinks back to normal soon. Thanks for hosting this party every week for us, Courtney. I enjoy it so much! ...i've had blue speckled eggs on my mind all week!! I adore how you have displayed yours in that mossy nest, atop the rusted urn!! ps. swooning over your fairest of the fair mirrors!! That is so pretty, Courtney and thanks for hosting. Thanks for hosting and for the inspiration you share! Thanks for hosting Courtney ~ I've visited before but I think this is my first party, maybe my 2nd. I've got spring fever too ! Love your little nest. Spring is almost here, Courtney! Love your little nest. Thank you for hosting us again this week! Courtney, I just love your spring offering. The wire cloche and the rusty urn. Courtney, I am really tired of winter too. Your cloche and rusty urn are so pretty and I love the little birds nest. Thanks for hosting. that's a darling arrangement in the little cage! Love how you put the nest into the tiny terra cotta pot. Happy Friday! oops, i meant the iron urn... wow! that is so cool to find a mini one like that! Thanks for hosting Courtney! You're so sweet! Pretty pretty...thanks for the feature, and thanks so much for hosting. Very pretty! Thanks for hosting and have a good weekend! Lovin' the starfish and egg combo! This nest arrangement is so pretty. Thank you for hosting the link party! We're having a wonderful Spring. I hope yours blooms soon, Courtney. Yes, Courtney, I think we are all done with the cold. Your touches of Spring look great and warm my soul. Now if only Mother Nature would oblige. Thanks for hosting! I am your newest follower! Come visit and would love for you to follow me! What a sweet bird cage display, Courtney! Very springy! What beautiful feathering finds this week. I adore the island makeover. I just wanted to tell you how much I admire you for taking all of the time you do to visit each and everyone that posts on your party. That is so amazingly rare and it makes us feel appreciated. Just wanted to let you know that your effort is noticed! thanks for hosting...i came and linked up from the picket fence. have a wonderful weekend! Courtney thanks for the invite I guess I was nervous to link because my room was not complete...... I love your nest! and your picks this week were amazing! Gotta love Rachel Ashwell!!! I love those first few pictures..how incredibly sweet and beautiful! Just found your blog and its lovely..enjoying poking around..I am newish to blog world..have a 2 month old blog about the building of our French home and my love for decor/design..Please visit me, doing an unreal giveaway, a pair of Murano handblown glass lamps from Swank lighting! Love how you feathered your nest with a nest. :-) Thank you for providing this linky party. I'm a new follower. I followed a link from Olga's Home and Garden Blog. Thanks for hosting; I just love this blog ! Courtney! Thank you for featuring my "drapes"!! I noticed on your party that even a lot of the images are not loading as pictures....what the heck is going on with Blogger? At least your post is loading with an image, it has really cut back folks reading my posts, as it shows only my signature. I think your party is a great take. By the way, I remember your pergola and wanting to do a similar thing myself. How horrid it got damaged!! Will you be posting on that? I'm loving your little nest coaxing in Spring. It's the first time I'm joining your party! 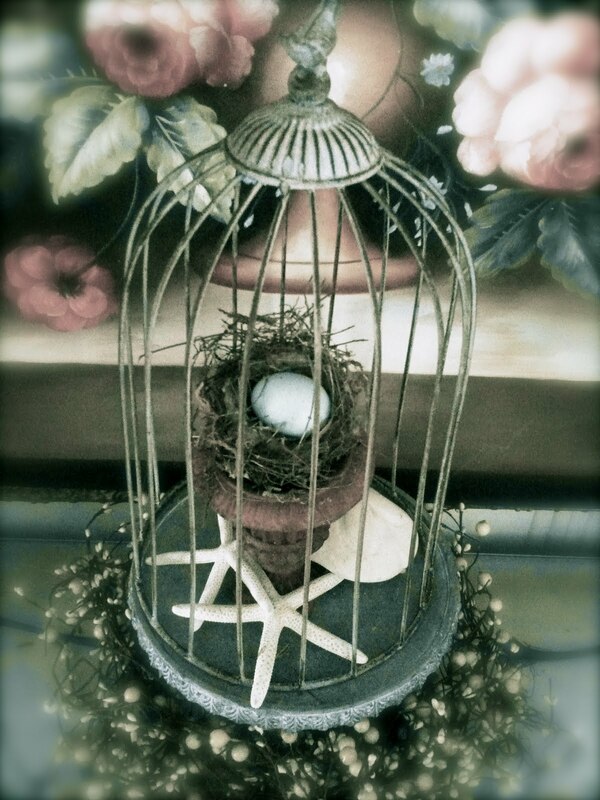 Simply adore your cloche with the sweet birds nest and the touch of starfish. I am going right now to take the skates and snowshoes off my porch, so done with winter!! i love your touch of spring... i need to get my spring on! Thanx again for hosting Courtney! Love all the highlights! Those are great picks. P.s. 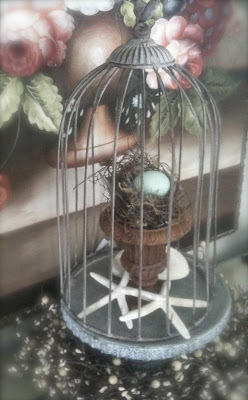 Also love your birds nest in the cloche! Thanks so much for hosting- and a very big thank you for featuring me !! Let's partyyy!! 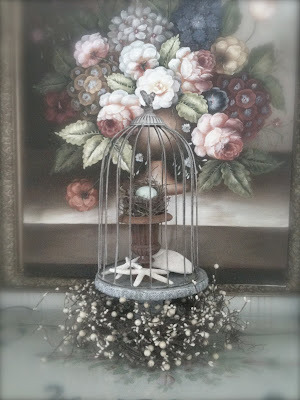 Your birdcage vignette s so perfect for Spring! Hello Courtney! March is SUCH a tease -- little sprouts in the border, tiny buds on some trees -- I cannot WAIT for April! Your nests are charming, and remind me to check if last summer's tiny birds' nests in our grape arbor survived this rough winter. I hope so! Have a lovely weekend, and keep thinking Spring. A gorgeous little spring display! I love the wire cloche and the sweet little nest inside is darling! We're a ways off for spring too, but I'm dying for winter to be over! Adore your display! The starfish really make it for me, simply beautiful! Can't wait for spring either, just when we think it's coming- another cold snap! This post definitely warmed me up a bit though, and I've got my own little project planned this weekend to "spring-up" our living room a bit. Thanks for the extra kick of motivation! Courtney your vignette is so beautiful! 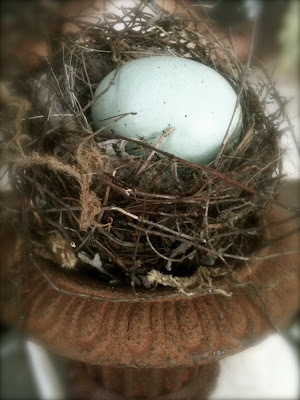 I love the little birds nest and Spring is definitely on my mind! You are so creative and your photos are just gorgeous! I am glad that you got a chance to get away and I so sorry about the damage from the storms, I hope things are able to be fixed. Loved the features, I will be checking them out! Thanks so much for stopping by and leaving such a sweet comment. Your spring vignette is lovley. I think we all have a bad case of spring fever. Your lovely photos brightened up this rainy day for me. Your vignette is beautiful, as always. Love your blog! And thanks for hosting this sweet linky party. I look forward to it each week. Thank you so for the sweet comment and invitation to join your party. I will definately try to do a post this Friday to join. I hope you have a great weekend. Courtney - I also wanted to thank you for dropping in on my blog and checking out my tobacco cabinet redo. It's so great that you host these parties and take the time to check out everyone's work. You're a great host! Thanks for stopping by and following my blog. I'm having a ton of fun cruising all of your Friday party goers! What a sweet little touch of spring! Thank you so much for stopping by my blog and leaving a comment!! It means a lot!! I am honored to join your link party, but I don't think it took and when I tried it again, it says the linky list is closed. :( Drop me a line if you get it fixed and I'll try again. Thanks again! !